This junior sized bed for a dolls house is made from wooden stir sticks and built in the shape of traditional picket fence gates. Photo copyright 2008 Lesley Shepherd, Licensed to About.com Inc. This junior dolls house bed for a dollhouse child is made of wooden stir sticks filed into pickets using the instructions given in the miniature techniques section. 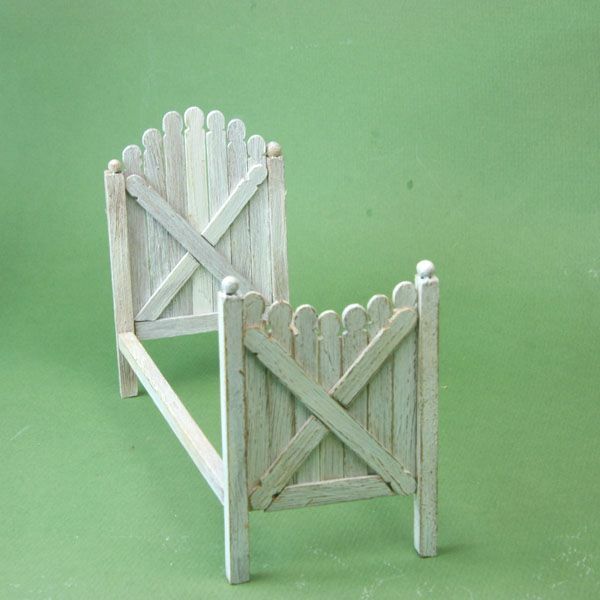 The same techniques can be used to make other picket fence projects including jump sections for model horse jumps. The bed as shown is 2 1/4 inches wide, by five inches long. A junior size for a young child just moving up from a crib. You can make the bed in a number of different sizes and styles using the techniques that follow. All the pieces (including the posts) can be made from wooden stir sticks. Wooden Stir Sticks filed to your choice of fence picket shapes according to these instructions. I used eighteen, 1/4 inch wide stir sticks for the headboard and footboard shown. Miniature File half round to file pickets as well as tenons for the mortise and tenon joins. Miniature Drill to drill holes for the mortise of the mortise and tenon join. Four Glass Topped Sewing Pins as finials for the bed posts. 1/4 inch Basswood Stock or laminated posts made from four stir sticks per post, glued together and sanded. You will need four, three inch lengths of square 1/4 inch basswood stock, or sixteen coffee stir stick lengths, 3 inches long, glued together in groups of four and sanded to square the sides. Craft Knife or hobby saw or rose pruners, or an Easy Cutter miter cutter. Glue a cross member to a dolls house scale gate made from coffee stir sticks. Photo copyright 2008 Lesley Shepherd, Licensed to About.com Inc.
To make a basic picket gate, decide how wide you want your gate to be, and how many pickets you will need. This gate was built 2 1/4 inches wide to make a junior dolls house bed in 1:12 scale. The number of pickets will depend on the size of your stir sticks, which vary widely. Cut the number of pickets you need to make the correct width of gate, plus two double ended pickets to use for the cross members of the gate. Measure for the cross members by measuring on one arm of an x across your gate and making two double ended picket pieces which measures this length. Lay the pickets out in the pattern of your choice, then mark the cutting line for the base of the gate. This gate was built to fit at a height of 3/4 inch from the ground, inside three foot high posts. To make a bed, one gate section was designed with an arched top and the footboard was designed with a reverse arch. A pill bottle lid the width of the gate was laid out on top of the pickets to position the pickets to form the arch shape. Then the ends of the pickets were marked to length and cut. Finish your pickets with the paint or finish of your choice and set them aside to dry. If you wish to weather the pickets, sand the paint when dry to distress the finish. When the paint is dry, lay out your pickets in the pattern for your gate, and glue the first cross member in place, clamping it to the gate pieces. Allow the cross member glue to dry. Mark the cutting lines for the second cross member for a dolls house scale gate. Photo copyright 2008 Lesley Shepherd, Licensed to About.com Inc. When the first cross member for your miniature picket gate is securely glued in place, lay the second cross member across the first, and mark where it crosses the first cross member. Trim the section out of the second cross member and glue it in place on the gate top, clamping it securely to the gate while the glue dries. This picket fence gate in dolls house scale is made entirely from wooden stir sticks. Photo copyright 2008 Lesley Shepherd, Licensed to About.com Inc. Finish the basic miniature picket gate by cutting and fitting a base board to cover the bottom edges of your gate. The base board should match up with the bottom edge, not overlap the edges. Glue the baseboard in place and clamp it until the glue dries. You now have a completed gate which can be used for miniature furniture, to make model horse jumps or garden scenes. Miniature dollhouse fence post finials made from glass topped sewing pins. Photo copyright 2008 Lesley Shepherd, Licensed to About.com Inc.
Make miniature round finials for dolls house fence posts (or bed posts) from appropriate sized wooden beads or glass topped sewing pins. Here a sewing pin has been cut with wire cutters until only 1/4 inch of pin remains below the glass ball top. The pin is then inserted into the center of a post top, and painted to match the post. If you do not have the right sized pin, you can glue round wooden beads to the top of the fence post. The holes in the beads will need to be filled with wood filler. Make simple mortise and tenon joints for dolls house furniture using a file and a tiny drill. Photo copyright 2008 Lesley Shepherd, Licensed to About.com Inc.
To join your miniature bed posts to your picket fence style bed, measure your three inch post beside your gate section so that there is a 3/4 inch gap between the bottom of the gate section and the base of the post. Mark on the post where the base of the fence falls. You will make your mortise (hole) for the joint for your bed rails so that it matches the bottom of the gate section. Remember to mark the headboard posts on the front of the headboard (the cross member design facing up). The footboard posts will be marked on the plain side of the gate section as the bed rail will run from the back of this gate section to the headboard. File the Tenons On the Bed Rails Use your file to create tenons or narrow square pegs that come out from the end of the bed rail. Cut two pieces of 1/4 inch square basswood stock to lengths of 5 1/4 inches. File away a quarter inch from the end of the bed rail on all four sides to make your tenon. Try to make it as square as possible. (see photo) File tenons on all four ends of the bed rails, keeping them as square and centered on the rail as possible. Use the Drill to Make a Mortise in the Bed Posts Use the drill to drill five 1/8 inch deep holes in each bed post, in a square section in the center of the post where you marked it. (see photo) Drill the holes close together in a number five pattern as seen on dice, but very close together. Use your file or a craft knife to square up the sides of the hole and test fit your bed rail tenon. Insert the tenon of the dolls house bed rail into the mortise you made in the bed post. Photo copyright 2008 Lesley Shepherd, Licensed to About.com Inc.
Test fit the miniature mortise and tenon joins on your picket fence bed together by inserting the tenon gently into the appropriate cut out mortise on each post. If the tenons and mortises you cut are all very different (only fit one particular section of bed rail) mark which section fits where so you will line up the correct posts on the gate section of your head and footboard. If your joints are very similar sizes you will not have to mark them individually for fit. Do not glue the bed rail to the post yet! Clamp and glue a set of bed posts to the side edges of the dolls house picket gate assembly to make a miniature head or foot board. Photo copyright 2008 Lesley Shepherd, Licensed to About.com Inc.
To assemble the miniature picket fence bed, lay your basic gate on a set of stir stick scraps so that the gate is slightly raised above your clamping surface. Line up your posts in position so that there is a 3/4 inch gap from the bottom of the gate to the base of the bed posts. Make sure your mortises for your bed rails are facing in the correct direction. On the cross member side for the head board, and on the side without the cross members for the footboard. Glue the gate sections to the posts so that the gates fall roughly in the middle of the posts (this is what your stir stick scraps are for. Clamp the sides of your posts so that they are held tightly against the gate. Leave to set. A dolls house bed head board and footboard made of miniature pickets cut from wooden stir sticks. Photo copyright 2008 Lesley Shepherd, Licensed to About.com Inc. The matching dolls house headboard and footboard are ready to make into a bed. Notice how the headboard (with the arched top) has the mortise holes on the front, while the footboard mortise holes are on the back side of the bed posts. A number of different picket designs are possible, these are only two. You could make a bed with a squared picket edge, a varied edge, or coming to a point. This picket gate bed for a dolls house child is made from common wooden stir sticks. Photo copyright 2008 Lesley Shepherd, Licensed to About.com Inc. Finish your miniature dolls house bed by gluing the bed rails into the head and footboard. Lay the headboard on a flat surface and apply glue to the ends of the bed rail tenon. Insert the tenon into the mortise. Fit both bed rails in place. Prop and leave to dry if possible. Lay the footboard upside down on a flat surface and fit the bedrails carefully into the mortise holes on the back of the footboard. Set the bed upright and clamp the bed frame gently until the glue dries. Make a base for your miniature bed from a piece of thin cardboard, or use a piece of aircraft plywood cut to size. You can cut a piece of foam to size and cover it with fabric for a mattress, or you can make a mattress from quilt batting in a fabric cover. You don't have to limit yourself to picket fence beds made from wooden stir sticks. Using the mortise and tenon technique you can fit plain slats between squared boards to make many different styles and sizes of beds. Simple technique and materials with lots of uses!